What Does an Environmental Technician Do? Environmental technicians typically work under the direction of environmental scientists. They monitor the environment and investigate sources of pollution by performing laboratory and field tests. They might be part of a team that includes scientists, engineers, and technicians from other disciplines, working together to solve complex environmental problems that affect public health. An environmental technician is sometimes referred to as an environmental science and protection technician. About 17,000 environmental technicians worked in the U.S. in 2016. About one in four of them worked in consulting services. 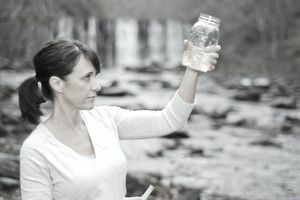 Collect water samples from raw, semi-processed, or processed water, industrial wastewater, or water from other sources to assess pollution problems. Perform project monitoring and air sampling for asbestos, lead, and mold abatement projects. Install and maintain data collection instrumentation. Conduct bacteriological or other tests related to research in environmental or pollution control activity. Operate light and heavy equipment including, but not limited to, pumps, vacuum, equipment, oil spill boom, generators, and bobcats. Perform basic calculations and computer data entry. Prepare and maintain necessary reports and records as required. Beginning environmental technicians work under the direct supervision of an environmental scientist or a more senior technician. With experience, they'll receive only general supervision and can eventually supervise those with less experience. The most highly compensated environmental technicians work for the government. This position requires some education and training. Education: You generally need only an associate degree or a certificate in applied science or science-related technology to work in this field. Some jobs do require a bachelor's degree in chemistry or biology, however. Licensure: In some states, environmental technicians who do some types of inspections need a license. The National Registry of Environmental Professionals offers various first-time certifications and information. Specialized training in the field can sometimes substitute for an associate degree, but you'll need two years or more. In addition to a license and formal training, an environmental technician needs certain soft skills, or personal qualities, to succeed in this occupation. Reading comprehension skills: You must have excellent reading comprehension skills in order to understand work-related documents. Critical thinking skills: These will allow you weigh possible solutions to problems. Communication skills: You'll most likely be working as a member of a team, so possessing strong listening, speaking, writing skills, and interpersonal skills is critical. You must convey information factually and clearly to the engineer or team leader when you can't resolve issues yourself. Observational skills: You must be able to recognize and identify potential problems without delay. The job outlook for environmental technicians is excellent. Employment is projected to grow faster than the average for all occupations from 2016 through 2026, by about 13%. Most environmental technicians work for consulting firms, local and state governments, and testing laboratories. They work in offices and laboratories, but they might also do fieldwork, which involves taking soil samples or water samples from rivers, lakes, and streams. Most jobs in this field are full time, but those that involve fieldwork can include irregular hours. Some jobs, particularly ones that rely on warmer weather for collecting samples from bodies of water or soil that isn't frozen, might be seasonal in regions with colder climates.